Vaikasi Visakam is celebrated as the birthday of Lord Muruga according to the Tamil calendar. It is celebrated in the month of Vaikasi, corresponds to the date between May and June according to the Gregorian calendar. On Vaikasi Visakam, the Nakshatra Vishaka coincides with the full moon or Purnima. Not only in India but across the globe, especially in places where Tamil lineage has made a considerable settlement over a period of time, like Sri Lanka, Maldives, Singapore, Malaysia ‘Vaikasi Visakam” is highly celebrated with pomp and glory. Lord Muruga is the second son of Lord Shiva, born out of his third eye in the form of fierce fire sparkles. As the intensity of the fire was unbearable even for the Gods, the sparks of the fire were dunked into the river to cool down. That mighty river is called “Saravana Poigai”, which dispersed the spark into six different sparkles. Each spark then incarnated as a child, which was raised by the celestial maidens, known as “karthigai Pengal”. Goddess Parvati then unified all the children into one single male child, and thus Lord Muruga has twelve hands, six faces in him. Lord Muruga is defined as a very beautiful, charming and divine personality, with high altitudes of knowledge and wisdom. “Skanda Purana”, refers Lord Muruga to be highly intellectual, to even teach Lord Shiva, the meaning of “Pranava Mantra”. He is enriched in valor that he also heads the army of Devas. Overall, he is a manifestation of charm, grace, power, devotion, and benevolence. Six different faces of Lord Muruga denotes six different attributes. First Face: Emits glorious rays of light to remove the darkness that encapsulates the world. Second Face: Showers gracious blessings with benevolence upon his devotees. Lord Muruga was mainly incarnated to destroy the evil Asuras, Soorapadman, Singamuhan, and Tarakan. The Asuras through their hard penance gained enormous favors and boons to be invincible. Only a special force, which is as mightier as Lord Shiva and born out of the Almighty, only can destroy the evil Asuras, who are then considered unconquerable through the special boon bestowed by Lord Shiva as the fruit of their devotion and meditation for years together. 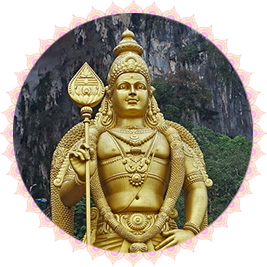 Lord Muruga is the combined power of Lord Shiva and Goddess Parvati, as he was born out of Lord Shiva’s third eye and was again fused by the Goddess. Lord Muruga also receives a special weapon from his mother which was the mighty “Vel”. It is an amulet which destroys the evil and protects people against any odds of life. Thus Lord Muruga, not only gains the power of Lord Shiva, but also invokes the special armament and powers from his Mother, Goddess Parvati, and becomes an immaculate power source. On this day, temples conduct special Pooja and rituals and offer “Prasadams” to their devotees. Among the Homas (a sacred ritual in which fire is invoked and meditated to appease the God) Kukuta Homa is performed by a group of scholars and priests. Devotees often carry milk pots known as “Pal Kudam” to perform Abishekam to the deity. “Pal Abishekam”, or divine bath with milk which is performed on the Lord’s idol, is said to have positive powers. Devotees gather in the temples from early morning to witness special “Pooja” and participate in all special rituals. Many devotees would also walk a long distance from their home to the temple. Temple’s chariot would make an enormous procession on the streets, along with the devotees. At home, people would fast, take up special “Vrat” on that day by restraining spicy food and resorting only to milk and fruits. Special chanting of mantras and offering “Prasadams” are a part of the ritual. People also sing hymns in praise of Lord Muruga. The lord’s idol or the picture of the Almighty is adorned with special garland and are decorated with flowers. Special offerings of honey, milk, fruits along with the cooked delicacies are offered as a tribute to the Lord. The entire day is filled with special Pooja, along with meditation at home. Lord Muruga showers his grace on all his devotees actively celebrating Vaikasi Visakam.